Brice Marden, Cy Twombly, Antoni Tapies. What would a modern abstract artist be without studio?. Artist´s studios are probably key for the devolopement of an artist. Light, location, disposition, many things affect the execution of a good abstract creation … In fact, a studio´s size 100% conditions the resulting artworks. It is generally said that the bigger they are, the bigger the abstract art creations. For this article I have selected interesting pictures of some famous contemporary and modern artists whose abstract art I admire, and have influenced my abstract creations. Take a look at them and at the end of this article, feel free to join the conversation by answering the questions. 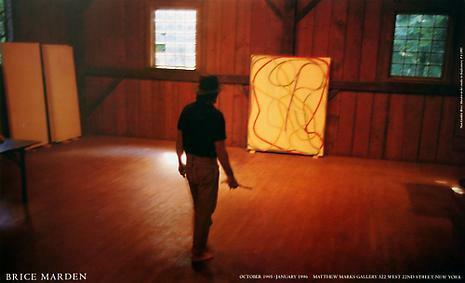 The above picture shows a piece of one of Brice Marden´s studios. It´s big, isnt it?. You can see he was working on two of his famous epitaph abstract painting series which are simply splendid. 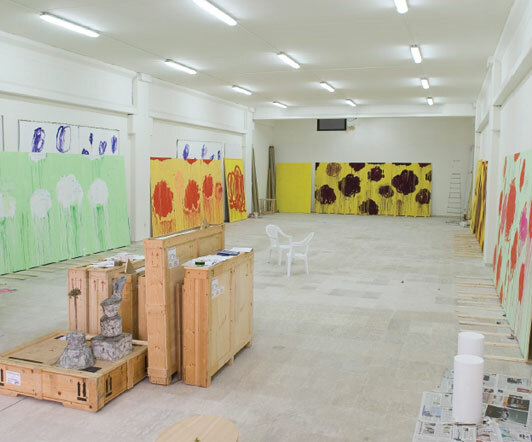 Below you see Cy Twombly´s studio. When this picture was taken, I guess he was working in his abstract roses series. Probably some of this magnificent, colorful and fresh contemporary abstract paintings where exibited at his famous Gagosian gallery exhibition. Check also this article where figurative painter Xavier Ribas explains why he considers Twombly a committed artist. 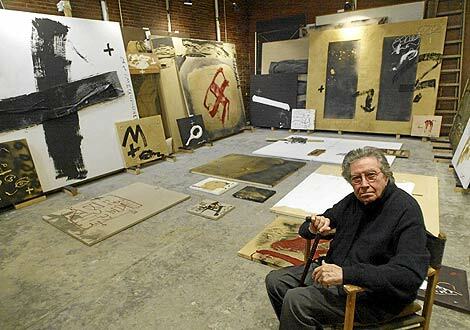 What about distinc and superb informalist Antoni Tapies studio. I was told that one of his studios (probably this one) had two floors. Each day when he finished working he used to walk up the stairs to the second floor, and see “with perspective” all the artwork made that day. It seems that this process helped him decide what creations where valid, and which ones nop. Well, this is all for today. Stay tunned for next post. I will continue showing famous abstract artists studios and stories. This is for contemporary artists reading this post. What characteristics are key for a good artist studio?. This is for contemporary gallerists, art curators or modern art collectors, please tell us,what do you like seeing and feeling when visiting an artist studio?. 6 Responses to "Modern Abstract Art: Abstract Artists Studios (I)"
Hi Tess, I could not have a studio like Francis Bacon one either :). Thanks for giving your thoughts and hope to see you back. I’ve been reading “Kitchen Confidential” by Anthony Bourdain, how he describes the setup of a chefs kitchen station. It reminded me of how important it is to have an art studio that is setup to serve the artist. Abstract artists, however, have different requirements than do realists, since they are always experimenting and taking their art beyond technique, finding new ways of expressing their feelings through spontaneity, which cannot be facilitated within a studio that is setup with all the “tools and materials” in the right place. The studio must be an open space, allowing room for change and growth of the creative process, just as the studios you have shown. The abstract artist is a “different kind of animal,” participating in a realm where truly fine art is created. Hi Edward, I find very interesting the way you describe abstract artists studios. I guess I agree with you with the fact that abstract artists are “different kind of animals” hence they need studios adapted to their special needs and art experimentations. Thanks for commenting and making the conversation grow.